In a blender add all the 1st layer juice ingredients and blend to a thick and smooth juice. pour this in individual glasses. 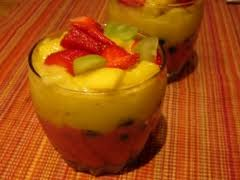 Top this with fresh cut fruits and whipping cream on top then drizzle this with a tsp of honey. Chill and serve with a straw.